Water and energy costs are rising and water conservation is a good environmental strategy. If your process cooling system is an evaporative cooling tower system, it relies on water evaporation for cooling. What can you do to save water and energy? 1. Turn the water set point up and keep it up at 85°F to 95°F. A higher set point will require less water evaporation. 2. Reduce water bleed off by refining your water treatment program to run higher cycles of concentration. Work with your local chemical treatment expert or look into a non-chemical system such as those manufactured by industry leaders Nexteq (phone: 440-338-3175) that will reduce water consumption. 3. Talk to your municipal water department about 'net water used' billing. Water company billing often includes water and sewer charges. The sewer charge is often based on discharging the same amount of water as is supplied yet with a cooling tower system the water sent to sewer is far less due to evaporation. Work with your water company to put a meter on the discharge so that you are only charged for the water used and actual water discharged. 4. Add a variable speed drive to your tower fan motor. Slowing the RPM just 5% can save 15% on energy costs. A variable speed drive provides lower energy costs and better performance compared to simply turning a fan on and off based on temperature. 5. 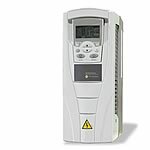 Add a variable speed drive to your process pump motor. Always maintain a constant pressure and flow to deliver just the water you need a process. When your tower water is cooler, less flow is required to your process and you save energy. Advantage 540 ton cooling tower system. Non-chemical water treatment used on Advantage pump tank station. Typical Variable Speed Drives application on Advantage pump station. Typical Variable Speed Drive Unit. For more information on reducing water and energy costs call the Advantage Sales Department at 317-887-0729. Would you like to Download FYI #287 to your browser?